2. I want my kids to understand that dinner time is special and that I value the time that we sit together as a family. When they see the effort I put into making the meal (and when I include them in the preparation - I'll do a separate blog post about cooking with kids) they are more inclined to eat what we are eating and try new foods. I also hope that as they get older, they will already have it engrained in them that dinner with the family is important. 3. It's part of my job. I don't mean that as a sexist thing but, that when we made the decision that I would stay home with our kids instead of keeping my full-time job in an office, part of that "job" was to maintain our home. That includes laundry, cleaning, grocery shopping, finances and cooking. Now, I don't do all of that on my own. David helps tremendously by often doing laundry (which I loathe), picking up missing ingredients at the store on his way home, vacuuming and helping clean up the toys at the end of the day (admist many other things). We are a team and I feel like a valuable way that I contribute to our family is by preparing delicious meals. So, here are 10 steps to making dinner happen. 1. HAVE A PLAN: there are a variety of ways to successfully plan your meals. Some people like to do it electronically, some people have a calendar with specific dates, some use a small list. I use this calendar and really like it because it's functional and pretty. Personally, I don't like to be restricted on which days I make certain recipes. I have seen other people make their menu for the entire month, but I like to do it weekly. My main reason for doing it weekly is that our plans often change throughout the month. I have a better gauge for how things will go week by week. Also, I like to make what sounds good to me at the moment. If I plan ahead on the 1st of the month, by the end of the month, I'm feeling pretty tired of what I've planned out. The last reason is that I sometimes will plan recipes based on grocery store sales or leftovers. Another thing I like to plan, is when to start cooking dinner. Some people make the mistake of not even thinking about preparing the meal until 5 or 6 p.m. I realize that events, work and school sometimes pose an issue, but that doesn't mean you can't be prepared. Here's an example: if you are planning on making a vegetable stir fry with brown rice for dinner - allot yourself enough time to cook that brown rice (usually 45 minutes). I have made mistakes like this many times and it really throws off your groove for the rest of the week's meals. 2. MAKE A LIST: a lot of people make the mistake of grocery shopping without a list and end up buying unnecessary and unhealthy food as they wander up and down the aisles (trust me - those aisles are set up that way for a reason). By doing this, they also end up spending too much money on another can of diced tomatoes when they already had two more in the pantry. You see what I'm saying? Make a list and stick to it. 3. USE A RECIPE: now, I'm not a stickler on this one because I love to invent my own meals and be creative. However, unless you're really comfortable in the kitchen, do yourself a favor and use a recipe. I'll discuss some ideas for where to find some (along with some of my favorites) down below. As you begin to feel more comfortable, using a recipe as inspiration is a great place to start. You may adjust seasoning to your liking and try different variations. 4. MAKE IT HEALTHY: everyone has an opinion about what is healthy and, while I have my own opinions, here is one basic rule to always follow: always serve at least one vegetable. I don't care if you don't like it, if your spouse doesn't like it or your kids won't touch it. Just make it. Learn how to properly cook vegetables (a.k.a. don't overcook) and learn to love them. 5. MAKE IT EASY: I have some friends who will scoff at this remark and say, "But I could burn water!" Well, of course, there are some basics that everyone needs to learn but that's what YouTube is for! :) If you don't know how to mince garlic or have never properly chopped an onion, watch a video on how to do it (or take a basic cooking skills class if you are able). Generally though, cooking is pretty easy. You don't need to be spending more than an hour cooking dinner each night. As you get more comfortable, doing basic things will become second nature and you will be able to make things quickly. Practice makes perfect! 6. INVOLVE YOUR FAMILY: cooking together is a great family affair and teaches many valuable lessons to your children. They will cherish the time that you spent teaching them and really learn to appreciate the art of cooking. This will help them later in life as they need to prepare their own meals, but also help them be more interested in the finished results - dinner! I'll blog more later about ways to involve your children in the kitchen. 7. BE CONSISTENT: we all have our days when we don't feel like cooking, and every once in a while, we all deserve a free pass. That said, making dinner is like any other habit: it takes two weeks to create a habit, and one day to break it. 8. MAKE IT PRETTY: this one might seem silly to some people but here's why presentation matters. Food that looks appetizing, tastes appetizing. There's a reason why I took an entire class on presentation skills in culinary school: it's important. Here are a few ways to "make it pretty": don't serve the food in the pan it was cooked in. Pouring spaghetti into a serving bowl and sprinkling with some cheese and fresh basil on top is easy and makes an impact. Also, set the table with real plates and silverware... yes, even for your children. If you're worried about your young ones breaking glass, buy some inexpensive glass plates (IKEA for example) and eat on those until they've gotten the hang of it. It teaches your children that they are special and this time together is a family is important. 9. REQUIRE MANNERS: you're not doing your children any favors by not requiring proper table manners. Children grow into adults and I can't tell you how embarrassing it is to be in public with an adult who has know idea how to behave in a restaurant. I have blushed at fellow restaurant patrons who hold their knives like a 3-year-old and chew sloppily. Teaching them young will help enforce the basics throughout their lives. If you didn't grow up with table manner enforcement (or just aren't sure of the rules), here's a great resource to the basics. I'm not asking you to harp on every little mistake your child makes at the table (remember, this should be an enjoyable experience) but a gentle reminder every once in a while will teach your children something all adults should know: how to eat like a civilized human. 10. MAKE IT FUN: cooking is serious business and there are certain safety requirements, but it should also be fun. Rather than dreading making dinner for your family every night, say to yourself: "Yes! I get to cook a delicious dinner for my family tonight!" It seems silly to say something like that, especially if you don't particularly mean it, but just thinking positively about the experience will make it more enjoyable. I actually love making dinner for my family. It's a wonderful service that we all enjoy together and is nourishing to our bodies and souls. - Korean Beef: can be served over rice with green onions and steamed broccoli or inside tacos with an Asian cabbage slaw. - Red Pepper, Corn and Green Chili Enchiladas: I now omit the chicken and make these vegetarian. They are always a huge hit! Served with a green salad. - Chicken and Mushrooms with Seasoned Rice: this is a great meal for guests or for your family. The chicken is moist and flavorful (don't overcook it!) and the seasoned rice is yummy. Serve with a green vegetable (like roasted brussels sprouts or broccoli). - Vegetable Frittata: a good vegetarian option that's quick and easy. Most everyone keeps eggs and some vegetables in their refrigerator. I like to serve this with a green salad and some salsa. I make this one a lot, especially since I eat vegetarian 90% of the time. Now those are just a few ideas but there are a million more on Pinterest! You can follow me here. Also, some of my favorite cookbooks are The Family Flavor by Whitney Ingram and most of the Barefoot Contessa cookbooks. This was SO long-winded but I hope it helps you all create some wonderful meals with less stress and more joy! Bon appetit! 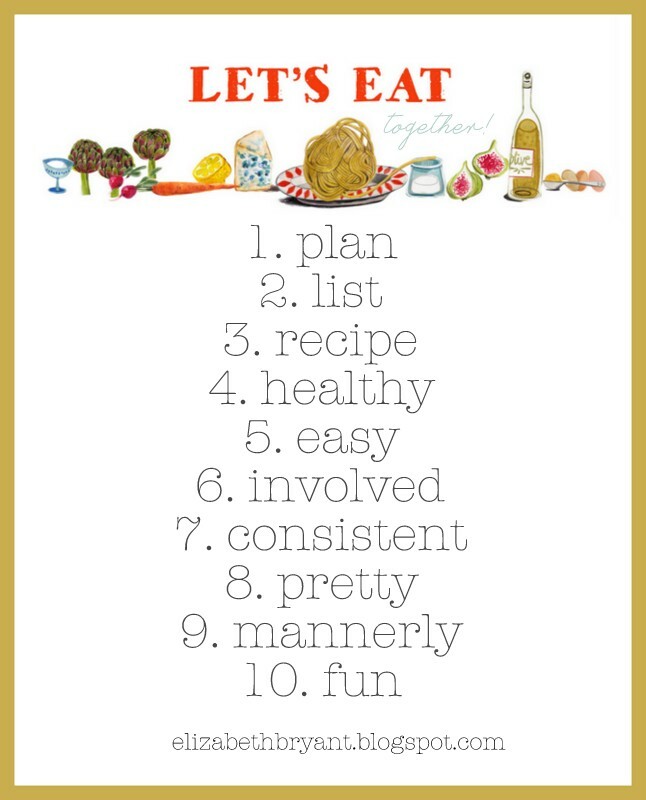 Credit: I used some of the beautiful illustrated pictures of Felicita Sala in my design of the "Let's Eat" poster. Check out her work here. Another great post! I think it is so important to cook healthy meals for your family and many young moms/women dread the extra work. My kids are good eaters and are willing to try new flavors more than other kids. This may be a reward for my cooking over the past years, or at least thats what i like to tell myself. :-) Right now i don´t feel like cooking so this was a great motivation for me to get back on the cooking waggon. Also, thank you for your recipes i´ll try the chicken and mushrooms tomorrow. Yay!! I love this! I agree with the importance of having family dinner together :) Practice does make perfect and if you get to make dinner everyday might as well enjoy it ;) Great one Liz! I made the Korean beef last night and all I can say is YUM!!!! My whole family loved it! I am NOT a cook but am really trying and this recipe made me feel like all "chef" like but was super simple. Thanks!! Thanks for the tips :) I will have to check out some of these fun recipes. This book is an interesting read and goes along with your post. It's called The Hour that Matters Most: The Surprising Power of the Family Meal. It supports your reasons especially #2.